I have written often about my opposition to the changes in the USTA junior competition structure, primarily because I didn't see in glaring need for changes to the structure as it existed. But once the changes were passed, the huge number of items to consider made it difficult to do more than take each change and evaluate its impact, one by one, then trying to overturn the especially misguided initiatives. That obviously has its drawbacks, the most basic of which is not seeing the forest for the trees. Having another proposal, an alternative to what was passed, both viable and realistic, was necessary, and fortunately, such a proposal is now out there. Lisa Stone at Parenting Aces published the proposal yesterday, with Geoff Grant and Steve Belisto credited with collating the suggestions and turning them into a comprehensive template for junior competitive structures. I don't agree with every little detail--I think a median ranking to determine a tournament's strength would be much better than using an average--but I find it in every way superior to what the USTA's Junior Competition committee came up with. I admit that I don't have much knowledge of the sectional tournament schedules around the country, but I trust those who have proposed these changes have done their best to consider the impact of what they are suggesting. Please read the proposal carefully and critically, commenting if you feel there are holes or unintended consequences. For more discussion on this issue, see the Stop 2014 National Junior Tennis Tournament Changes Facebook page, which is now approaching 2000 "likes." The USTA frequently conducts Player Development Training Camps during a home Davis Cup tie, and today they announced the players who are in Jacksonville for the camp for Friday's tie with Brazil. Eric Nunez and Diego Montoya are the USTA coaches conducting the camp. The USTA also announced a feeder program for the National Training Center in New York, with Erik Kortland hired to work with these younger players. There will be an open tryout for spots in this feeder program, for ages 9-13, on Saturday, February 2. For the complete release, see usta.com. As I mentioned yesterday, my recap of the Miami women's 4-3 ITA Kick-off Weekend win over Arizona State last Saturday is available today at the Tennis Recruiting Network. I've been fortunate to have competitive matches to cover whenever I travel to a dual match, and this was one of the more dramatic ones. The new ITA Division I team rankings were released today, and there were few changes, with the Virginia men and Florida women retaining the top spots. The Tennessee and Texas A&M men made the biggest jumps: Tennessee moved from 19 to 15 and A&M from 26 to 16 based on their road wins in the Kick-off Weekend finals. As for the two men's hosts who lost, Stanford fell from 10 to 18 and Illinois from 16 to 25. There were no changes in the top 8 of the women's rankings. Miami fell from a tie for ninth with Alabama to tenth, while Ole Miss, the only women's host to lose in the Kick-off competition, went from 19 to 27. These are the last women's rankings before the Team Indoor, so the seeding will be based on these. The men will have one more set of rankings next week, with their tournament a week later than the women's. For the complete rankings see the ITA website. The NCAA announced sanctions today against Conference USA member Southern Mississippi for violations in their men's tennis program. The head coach and assistant coach were cited for "unethical conduct" which included offering money and a car to a student-athlete to keep him from transferring, and paying another student-athlete to write a paper for the student-athlete the coach wished to keep. The program will be banned from the postseason for one year, which isn't a particularly harsh penalty, as they didn't qualify for the NCAAs last year, although they did play in the Conference USA season ending championships in 2012. Other sanctions are detailed in the NCAA announcement with the complete report available as a download in the upper right corner of the announcement. For reasons I don't understand, the coaches were not named by the NCAA, but they are named in this article by the local Hattiesburg, Mississippi newspaper. 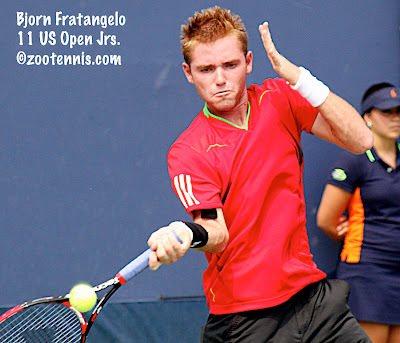 I'm late with a Pro Circuit update this week due to the Tennis Plaza Cup, but 19-year-old Bjorn Fratangelo (2009 B18s Plaza Cup champion) won his first Futures title in Weston Sunday. Unseeded and receiving entry via a special exemption for reaching the semis in Sunrise the previous week, Fratangelo beat No. 8 seed Jason Kubler 6-4, 7-6(7) in the first round, No. 4 seed Robby Ginepri 6-3 3-6 6-4 in the semifinals and No. 5 seed Arthur DeGreef of Belgium 6-4, 3-6, 6-0 in the final. The doubles title went to Brazilians Daniel Dutra da Silva and Caio Zampieri, the No. 3 seeds, who beat unseeded Sekou Bangoura and Patrick Daciek of the US 7-6(4), 6-2. 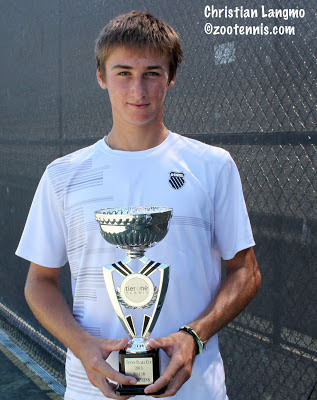 In the $10,000 ITF Men's Circuit event in England, former Texas Longhorn Ed Corrie won his first singles title as a professional, beating 18-year-old Christian Harrison 2-6, 6-3, 7-5 in a final featuring two unseeded players. The doubles title went to former LSU players Ken and Neal Skupski, who, like Corrie, are from Great Britain. Ken Skupski is ranked 51 in ATP doubles, which means he was doing his younger brother a favor by competing at that level. There was no Pro Circuit women's event in the United States last week, and there isn't one this week either, but the men have another $10,000 Futures, this one in Palm Coast, Florida. The first round was completed today, with 17-year-old Spencer Papa picking up his first ATP ranking point with a 6-3, 6-4 win over former Florida State standout Vahid Mirzadeh. Stefan Kozlov, in his second tournament after being out four months with an injury, qualified, but lost in the first round to former Georgia Tech star Kevin King. Henrik Wiersholm also qualified, but he too lost to a former collegian--Jason Jung from the University of Michigan. In the $10,000 ITF Men's Circuit tournament in Tijuana, Mexico, 16-year-old Ernesto Escobedo of qualified and won his first round match, the second main draw match he has won at that level. Duke recruit TJ Pura, who like Escobedo is from Southern California, qualified but dropped his opening round match. A week after releasing the recruiting class rankings for the men, the Tennis Recruiting Network announced their rankings for the women's class of 2013 Monday, with the University of North Carolina taking the top spot. The Tar Heels signed two blue chips--Hayley Carter and Jamie Loeb--and they received 15 of the 25 first place votes. Second was Northwestern, with blue chips Madeline Lipp, Jillian Rooney and five-star Manon Peri, and third was Stanford with ITF Top 10 junior player Carol Zhao of Canada and blue chip Taylor Davidson. As is mentioned in the notes at the bottom of the rankings, Caroline Doyle announced for Stanford after the voting lists had already sent out, but there will be an opportunity to include her when the final voting for the 2013 class is held, after the spring signing period. Stanford received 5 first place votes, Northwestern 2, Harvard 2 and Houston 1. In contrast, the men's rankings saw Virginia receive 22 of the 24 votes cast. Because the Tennis Plaza Cup was a week later this year, I wasn't able to follow the ITA Kick-off results as closely as I usually do, but I did manage to extend my streak of covering a regional final to four, thanks to the University of Miami's hosting just a few miles from the Plaza Cup site. My story of the Hurricane's 4-3 win over Arizona State will be out Wednesday at the Tennis Recruiting Network, but tonight I wanted to provide a brief recap on some of the more interesting results. Not counting host Washington, there are three men's teams who succeeded in advancing to the Team Indoor who were not in Virginia last year: Oklahoma, Mississippi and Mississippi State. Mississippi State, which hasn't been to the Team Indoor since 1999, beat Auburn 4-3 in the final, with Roman Bogaerts defeating Andreas Mies at the No. 1 position to clinch the victory in Starkville. In another 4-3 nail biter, Cal beat Michigan despite losing five first sets in singles. Two host teams failed to advance on the men's side, with No. 1 seed Illinois falling in the first round in Champaign to No. 4 seed Tennessee, who went on to beat North Carolina 4-1 in the final. It was an extremely competitive regional, with all four teams ranked between 16 and 24. Another No. 4 seed, Texas A&M, also advanced to Seattle, with a first round win over tenth-ranked host Stanford and a blanking of San Diego in the final. The four new women's teams I'll be seeing in Charlottesville in just over a week are Nebraska, Alabama, Texas A&M and Vanderbilt, none of whom qualified for the Team Indoor in 2012. Nebraska hosted Notre Dame, Georgia Tech and Tennessee, ranked 18, 22 and 23, so it's no surprise it took some doing for the Cornhuskers to advance to Charlottesville. They beat Tennessee 4-3 in the first round, and eased past Notre Dame 4-1 in the final. Alabama defeated Clemson 4-2 in its final in Tuscaloosa and Texas A&M downed Arizona 4-0 in College Station to reach the Indoor for the first time since 2005. Vanderbilt was the sole women's team to come through on the road in another competitive regional at Ole Miss, with Illinois and Yale the No. 2 and No. 4 seeds. Yale beat No. 1 seed Ole Miss and No. 3 Vanderbilt downed Illinois in the first round, and Vanderbilt earned a spot in the Team Indoor for the first time since 2007 with a tough 4-1 win over Yale in the final. For more on the ITA Kick-off Weekend, see the ITA website, which has the results here, and a recap here. Winds gusting over 20 mph didn't keep the top seeds from claiming the winners trophies Monday at Salvadore Park Tennis Center, with boys 18s No. 1 Christian Langmo, boys 14s No. 1 Vasil Kirkov and girls 14s No. 1 Maria Mateas earning straight set victories in the USTA Regional Tennis Plaza Cup finals. Langmo defeated No. 3 seed Catalin Mateas 7-5, 6-4, after both players had struggled with the breezy conditions in the opening games. "At the beginning, both of us were holding serve easily," said Mateas, a 15-year-old from Massachusetts who trains at the USTA National Center in Boca Raton. "We couldn't have a rally over four or five balls, and I think it took us a little bit to get used to the conditions. But after that we had a good match, the level was pretty high." The first ten games went to the server, until Mateas gave Langmo a couple of unforced errors to drop serve. Serving for the set, Langmo earned his first set point at 40-30, but Mateas, who has a one-handed backhand, hit a winner from that side to get back to deuce. After Mateas sent a forehand wide, Langmo had a second set point, and this time he converted, hitting a forehand winner within an inch of the sideline to secure the first set. "I think he just kind of lost focus at 5-all," said Langmo, a 16-year-old from Boca Raton. "He played a couple of loose points, I took advantage of that, and that was the difference." Mateas again saw his concentration waiver in the second set, and serving at 2-2, unforced errors put him behind 15-40. He saved the first break point with an ace, but then double faulted. Langmo consolidated the break with a love hold for 4-2. Serving to stay within striking distance in the next game, Mateas again was broken, due to his own mistakes more than any stretch of great play from Langmo. With a 5-2 lead, serving for the match, Langmo could see the finish, and that proved more than he could handle. Mateas hit a backhand lob winner to earn two break points, and he converted the second when Langmo's attempt at a backhand pass went wide. "I got a little tight once I broke him again, actually," said Langmo. "I stopped focusing point by point--I just saw the trophy, you know. He loosened up and relaxed and started swinging away and his shots were going in." Mateas saved a match point serving at 3-5, with a deep forehand that Langmo couldn't handle, then hit two winners, notifying Langmo he would have to raise his level in the next game. It didn't appear Langmo would be able to hold off Mateas' surge when Langmo double faulted to open the 5-4 game, then fell behind 15-40 when his backhand went long. Mateas netted a forehand to squander one break point but the second one Langmo saved with his own athleticism, hitting a tough overhead winner from an awkward position on the court to get back to deuce. Two good serves later, Langmo had the victory, and when Mateas' return flew out, he let out a deep roar of happiness and relief. "It was building up over two games, every moment," Langmo said of his stress level. "I think I did a good job of composing myself, but I was very tight out there. I just felt numb, just wanted to be off the court. I was fortunate to hit some good serves." Mateas was gracious in defeat. "I thought I played a good match overall. He played better than me," Mateas said. "I stepped it up a little bit at the end, but it wasn't enough to come back. He hit a couple of good serves, and just played better than me today." Langmo, who trains in Boca Raton with Roger Anderson, coach to and now husband of WTA Top 100 pro Chanelle Scheepers of South Africa, was pleased that he could win as the top seed. 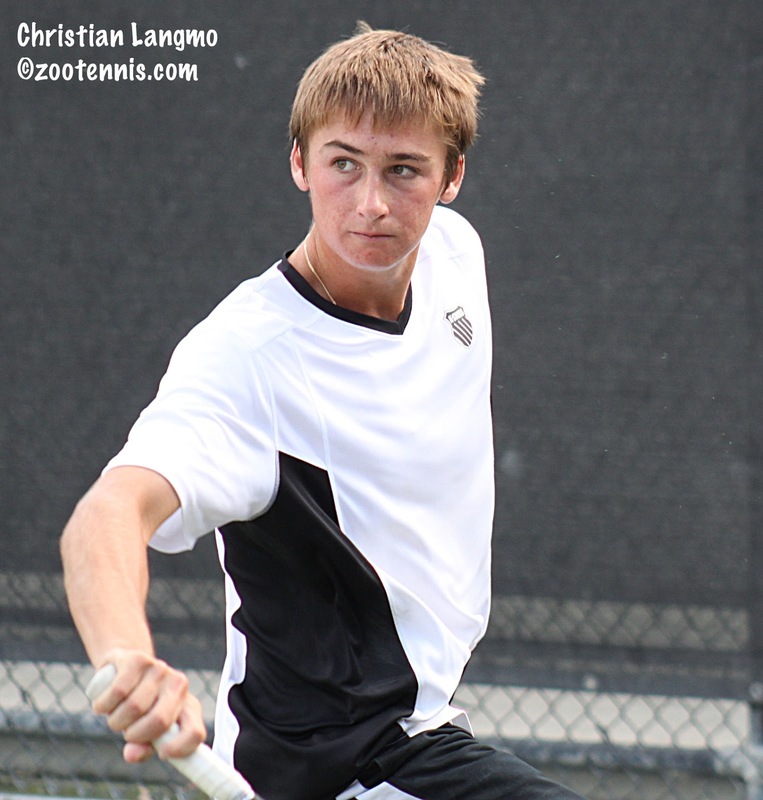 "I've never been a number 1 seed at this high a level tournament," said Langmo. "I think I did a good job of handling the pressure. There were a lot of good players who could have for sure taken me out, so I did a pretty good job of staying focused and grounded." In the 14s, Kirkov was also seeded at the top for the first time, and with his 6-3, 6-2 victory over unseeded Antoine Sanchez, Kirkov finished the tournament without dropping a set. Although Sanchez was unseeded, Kirkov knew he was facing a dangerous opponent in the final, as the two had met in a Florida sectional event earlier this month, with Kirkov taking a 6-4, 7-5 victory. "We had a tough match two weeks ago, so I came into the match feeling really nervous," said Kirkov, a 13-year-old from Tampa. "He's a good player, so I just had to play my game. I was playing aggressive and not missing a lot, and keeping my focus on the game and not thinking about win or lose." Kirkov's nerves may have shown early in the first set, when Sanchez broke him for a 2-1 lead, but Kirkov broke back immediately and began to take control of the match. He broke Sanchez, who is more physically mature than the diminutive Kirkov, at 3-4, then served out the opening set. An early break in the second set, and Kirkov was on his way, ending the match with a drop shot that Sanchez reached but couldn't get back over the net. His dominating performance, which included the doubles title with Boris Kozlov, was even more surprising given some physical problems Kirkov was having with his knees. "I couldn't really move today," said Kirkov, who counts his mobility as one of the strengths of his game. "My knees are kind of hurting right now--growing pains." Maria Mateas, who defeated No. 4 seed Maria Ross 6-2, 6-1, had no difficulty with the field in her run to the girls 14s title. She never dropped more than four games in the ten sets she won, even though she too was a top seed for the first time. "I felt a little bit of the pressure coming into the tournament, when I saw I was the No. 1 seed," said Mateas, the 13-year-old sister of boys 18s finalist Catalin. "I was like oh, I better prove myself. I fought in all of my matches and I knew I could beat everyone, so I was happy." Against Ross, Mateas kept the ball in play more consistently and didn't let the wind frustrate her. She took 3-0 leads in both sets, and Ross couldn't exert much pressure, holding serve only twice in the match. "She missed more than me, and I think that was the key, being consistent," said Mateas, who trains in Massachusetts with her father Calin. "I was also trying to move in as much as I could and be aggressive. She did miss a lot, although not necessarily all were unforced errors. She did hit a lot of unforced errors, but I tried to force her as much as I could." Top seeds collected three other Tennis Plaza Cup titles Monday at two other Coral Gables locations. Reilly Opelka, No. 1 in the boys 16s, played that division rather than the 18s on the advice of USTA National Coach Diego Moyano and the 15-year-old passed that test with flying colors, dropping no more than three games in any set in his five victories. Opelka defeated unseeded Nikola Samardzic 6-3, 6-2 in the final at the Biltmore Tennis Center. In the boys 12s, top seed Adam Neff defeated No. 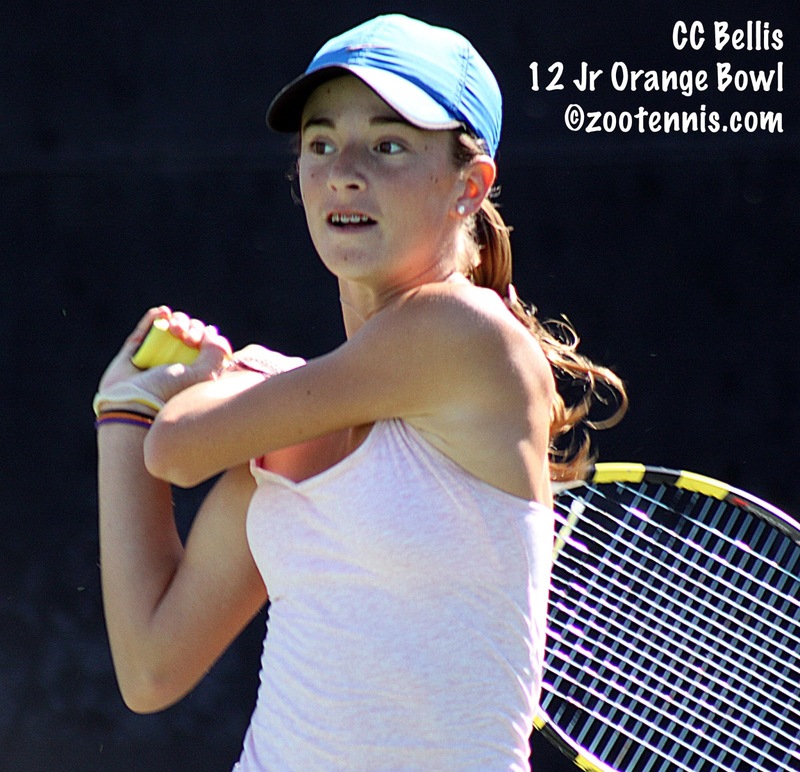 2 seed Tyler Zink 6-2, 6-2 in the final, and in the girls 18s, played at Riviera Country Club, No. 1 seed Katerina Stewart completed her straight-set run through the tournament with a 7-5, 6-2 win over No. 4 seed Kristin Wiley. The girls 12s title was won by No. 7 seed Whitney Osuigwe, who defeated No. 2 seed Zoe Hitt 6-2, 6-2. The girls 16s championship went to No. 6 seed Bridget Forster, who defeated unseeded Leyla Azaeva 7-6(0), 6-3. For complete draws, including the doubles championships, see the TennisLink site. CiCi Bellis became the first US girl to win Les Petits As since Bethanie Mattek in 1999, the year the 13-year-old from Atherton California was born. The third-seeded Bellis defeated top seed Andreea Rosca of Romania 6-1, 6-2 in 51 minutes in Sunday's final. Up 6-1, 5-0, Bellis had match points on Rosca's serve, but didn't convert, and squandered another while serving for the match at 5-1, but broke Rosca to add the singles title to the doubles title she and Jaeda Daniel won on Saturday. Last year American Francis Tiafoe won both singles and doubles at Les Petits As, and, like Bellis, Tiafoe also won the Aegon Teen Tennis singles championship in Bolton the week before. But Bellis, the 2011 USTA girls 12s champion, went one better, sweeping all four titles in the two Tennis Europe Grade 1 championships, a remarkable accomplishment. Bellis is the first girl to win both singles and doubles at Les Petits As since Russian Daria Gavrilova did it in 2008. The boys title went to Italian Samuele Ramazzotti of Italy, the No. 2 seed, who defeated top seed Miomir Kecmanovic of Serbia 7-6(8), 0-6, 6-0. Ramazzotti is the first Italian, boy or girl, to win the Les Petits As title. For photos and complete draws, see the tournament website. Draws are also available at the TennisEurope website. The finals are set at the Tennis Plaza Cup USTA Regional Level 3 in Coral Gables, Florida, with top seeds competing in six of the eight finals. The girls 16s and girls 12s are the only exceptions, and the 12s division lost its top seed, Tyra Hurricane Black, before the tournament began. At Salvadore Park, where the quarterfinals and semifinals were played today in the boys 18s and boys 14s division, top seed Christian Langmo got the most unusual win of his tennis career in the semifinals, when his opponent, unseeded Alfredo Perez, was defaulted from the match at 3-3 deuce in the third set. Perez was defaulted for his third audible obscenity in the match, the first two coming in the last game of the first set when he was serving trailing 3-5. The rallies between Langmo and Perez had been of extremely high quality throughout the first eight games, with both hitting the ball deep and with pace. The Har-Tru courts at Salvadore Park prevented first-strike tennis, which both Perez and Langmo would have excelled at on a faster surface, and the result was entertaining points that featured offense, defense and even occasional net play. Neither player was making many unforced errors, and the frustration of having to win points began to take its toll of Perez. At 3-5, 0-30, after a Langmo winner, Perez yelled out "he's playing out of his f***ing mind" and a roving umpire gave him a point penalty, making it 0-40. Perez responded with two consecutive aces, but on the third break point, Langmo hit a difficult backhand volley winner. What Perez said next was not audible from where I was standing, but it was audible to the same roving umpire, who then gave him a game penalty. Langmo got a hold of serve without hitting a ball, and after Perez held for 1-1, Langmo took the next three games. Perez appeared to have forgotten about the incident and any comments he made were not profane, and he got two consecutive breaks of Langmo, his first of the match to take a 5-4 lead. Perez couldn't serve it out however, getting to deuce but no closer with a Langmo forehand forcing an error to make it 5-5. Langmo held, and with Perez serving at 5-6, 30-30, Perez failed to get a first serve in, which had bailed him out of tight spots in the previous games. He netted a forehand to give Langmo a match point, and when a Perez forehand appeared to go an inch or so long, he might have won it. But Langmo didn't call it out, hit it back then stopped and checked the mark and called it out. The assistant referee on the court ruled he had not made a prompt call and had played the ball. This sent Langmo into a funk and after Perez won the next two points to make it 6-6, Langmo was still saying "I already won this match." The tiebreaker was all Perez, and Langmo said he did let the un-match point get to him. "I probably let that bother me for the rest of that set, and it showed in the tiebreak," said Langmo, a 16-year-old from Boca Raton. "Having a match point is obviously a big thing, and I figured that I'd won the match because the ball was out, I just called it late. But I was able to regroup for the third." Langmo benefitted from the 10-minute break between the second and third sets. "For me I think it was a good thing," Langmo said. "It let the momentum kind of level off, stopped his momentum and put us back on even terms, I think." The third set continued with both boys playing well and holding serve until, at 3-3, Perez let a 40-15 lead get away. When he failed to win a third game point, he shouted that he was playing like the Spanish word for excrement. The assistant referee checked with her Spanish-speaking colleague to make sure she had heard it correctly, and called both boys to the net, where she awarded the match to Langmo. Langmo shook Perez's hand, then Perez tossed his racquet in the direction of his bag and after a few seconds sat down and loudly said the same word again. Because he was defaulted for misconduct, the 15-year-old from Coral Gables was not allowed to play his doubles match later in the day. Langmo said he had never been awarded so much as a game, let alone a match, for his opponent's misconduct. Langmo said he understood how Perez might forget he was on the edge of default. "I think he knew, but sometimes when you're in the situation, it's tight, it's just a reactionary thing," Langmo said. "You really can't help it. So you just have to practice controlling yourself sometimes. It's never good to win a match that way, but I'm happy I got through it." Langmo's opponent in Monday morning's final is No. 3 seed Catalin Mateas, who has yet to drop a set in his four victories. Mateas beat unseeded Bernard Tefel 7-5, 6-0 in the quarterfinals and No. 5 seed Stephen Watson 6-3, 6-4 in the semifinals. Watson didn't have the energy to stay with Mateas after needing over three hours to defeat unseeded Jake Stefanik 5-7, 7-5, 6-4 in their quarterfinal contest. 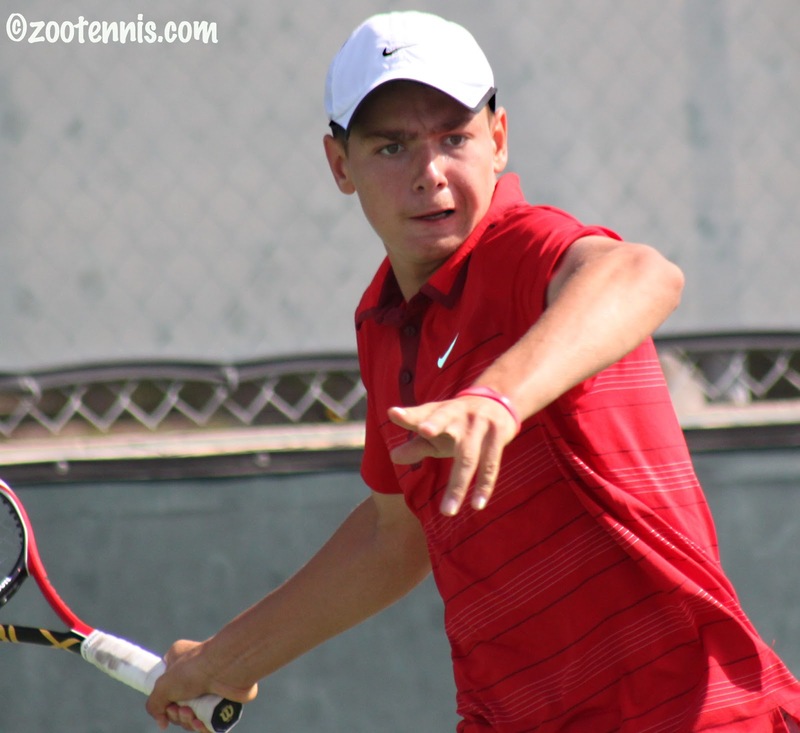 In the boys 14s final Monday, top seed Vasil Kirkov will play unseeded Antoine Sanchez. Kirkov defeated doubles partner Boris Kozlov, last year's Plaza Cup boys 12s champion 6-2, 6-2 in the semifinals, with Sanchez surprising No. 2 seed Morgan Dill 0-6, 6-4, 6-0. Sanchez trailed 6-0, 3-0 before winning 12 of the next 13 games. 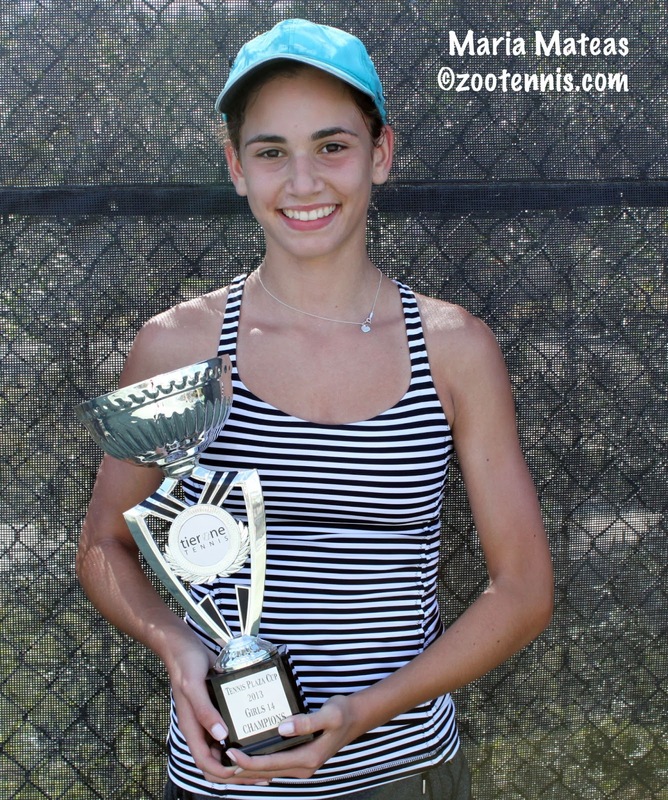 The girls 14s final will feature another Mateas, Catalin's sister Maria, the top seed. She will play No. 4 seed Maria Ross. The girls 14s were played at Coral Gables Country for the first two days, but the finals will be Monday morning at Salvadore Park. The girls 18s final at Riviera Country Club will be between No. 1 seed Katerina Stewart and No. 4 seed Kristin Wiley. At the Biltmore Tennis Center Monday, the 12s and 16s finals are on tap. In boys 16s, Reilly Opelka will play unseeded Nikola Samardzic for the title, and in the girls 16s, it will be No. 6 seed Bridget Forster against unseeded Leyla Azaeva. The 12s, which played the first two days at Tropical Park, will finish at the Biltmore, with No. 2 seed Zoe Hitt and No. 7 seed Whitney Osuigwe playing for the girls title. The boys 12s final will be between No. 1 seed Adam Neff and No. 2 seed Tyler Zink. Draws are at the TennisLink site. I spent the morning at the Tennis Plaza Cup watching some of the boys 18s, spent the afternoon at Miami's exciting 4-3 win over Arizona State, and spent the evening writing about that match for an article on the Tennis Recruiting Network next week. But I want to catch up on the news in college and junior tennis today, which starts with Nick Kyrgios' title at the Australian Open. Kyrgios, the No. 3 seed, defeated friend Thanasi Kokkinakis, a wild card, 7-6(4), 6-3 to become the fourth boys champion from Australia in the past seven years. Brydan Klein won the title in 2007, Bernard Tomic in 2008 and Luke Saville last year. Kyrgios, who won the Grade 1 the previous week to take over the No. 1 spot in the ITF rankings, now has an 18-match winning streak in the ITF juniors, just as girls champion Ana Konjuh of Croatia does. This is Kyrgios' first singles title in a junior slam, but he won the doubles championships last year at Roland Garros and Wimbledon with Australian Andrew Harris. The ITF junior website's article on the girls and boys finals is here. For more on Kyrgios' title see this article from the Australian Open website. More on Konjuh's win is here. CiCi Bellis will attempt to sweep the singles and doubles of the two prestigious 14-and-under Tennis Europe Grade 1 events when she plays for the Les Petis As singles championship on Sunday against top seed Andreea Rosca of Romania. Bellis, who won the singles and doubles at Teen Tennis last week, won the doubles today at Les Petits As, with the same partner, Jaeda Daniel. Bellis and Daniel, the top seeds, defeated No. 8 seeds Magdalena Pantuckova and Marketa Vondrousova of the Czech Republic 6-3, 7-5. Bellis, the No. 3 seed in singles, defeated No. 2 seed Sofya Zhuk of Russia 6-2, 6-3 in the semifinals. The boys final features top seed Miomir Kecmanovic of Serbia and No. 2 seed Samuele Ramazzotti of Italy. Artem Dubrivnyy of Russia and Ergi Kirkin of Turkey won the boys doubles. For the complete draws, see the Tennis Europe website, or for live scoring, see the tournament website. On Friday, Duke University head women's coach Jamie Ashworth released a statement saying that sophomore Trice Capra had been dismissed from school for a violation of school policy, but would be eligible to return in the fall. I am hoping to relay a statement from Capra about this in the next few days, but I currently do not know anything beyond what appears in the announcement. At the Tennis Plaza Cup, top boys 18s seed Christian Langmo had a tough first round match, needing nearly two hours to defeat Nile Clark 7-6(5), 6-4, but won his second round match as well to advance to the quarterfinals. No. 2 seed Chase Perez-Blanco, who took the SAT test in the morning, won his first round match, but fell ill during his second match and retired to Jake Stefanik after winning the first set 6-1 and trailing 4-3 in the second. Katerina Stewart, the top seed in the girls 18s, had no difficulty advance to the quarterfinals. The TennisLink site for the Tennis Plaza Cup has the updated draws. Ana Konjuh of Croatia added the Australian Open girls singles title to the doubles championship she won on Friday, defeating Katerina Siniakova of the Czech Republic 6-3, 6-4. It was Konjuh's 18th consecutive win in an ITF junior tournament, and certainly the biggest, with the Eddie Herr and Orange Bowl champion coming from 4-1 down in the second set to get her third straight win over Siniakova. Konjuh, the No. 3 seed, had beaten Siniakova in three sets in the Eddie Herr semifinals and in straight sets in the Orange Bowl final. According to the IBM match stats, Siniakova, the No. 2 seed, made only 35 percent of her first serves, while Konjuh had a 67 percent success rate in the one hour and two minute match. By my points calculations, Konjuh will now go to Number 1 in the ITF junior rankings, replacing Taylor Townsend, who did not defend her singles and doubles titles in the Australian junior championships. Konjuh teamed with Stanford recruit Carol Zhao of Canada to take the doubles title on Friday, with the top seeds defeating No. 6 seeds Oleksandra Korashvili of Ukraine and Barbora Krejcikova of the Czech Republic 5-7, 6-4, 10-7. The boys doubles championship went to Jay Andrijic and Bradley Mousley of Australia, who beat Maximilian Marterer of Germany and Lucas Miedler of Austria 6-3, 7-6(3). I'll have the results of the boys final in my Saturday post. Or see the Australian Open website. 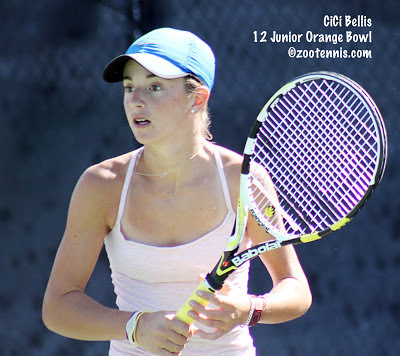 CiCi Bellis has reached the semifinals of Les Petits As after defeating No. 5 seed Anna Ureke of Russia 6-4, 6-3 on Friday. Bellis, the No. 3 seed, will play No. 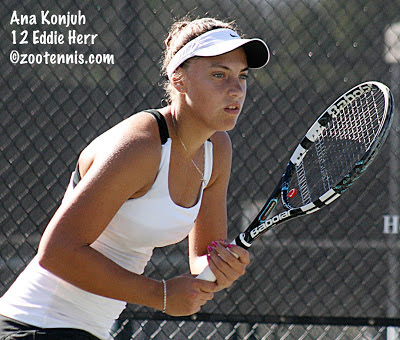 2 seed Sofya Zhuk of Russia, the 2011 Eddie Herr 12s finalist, in Saturday's semifinals. Bellis and Jaeda Daniel, the top seeds, will play in the doubles final Saturday against No. 8 seeds Magdalena Pantuckova and Marketa Vondrousova of the Czech Republic. For the complete results, see the Tennis Europe website. The draws for the USTA Regional Level 3 Plaza Cup are up at the TennisLink site. I will be primarily covering the boys and girls 14s and the boys 18s, which are at Salvadore Park. I also will be going to the University of Miami on Saturday to see the Kick-off Weekend final between the Miami and Arizona State women, which I will write about in detail for the Tennis Recruiting Network next week. It was a long travel day today, but worth it; after leaving Michigan with the temperature at 2 degrees, the 70s here in Florida sure felt good. I am here again to cover the Tennis Plaza Cup, the regional level 3 USTA event that I've been attending for five years, which begins Saturday. So tonight, I'll just give a quick update of Les Petits As and the Australian Open juniors. The US players are doing better in the former, with CiCi Bellis and Michaela Gordon through to the quarterfinals with tough three-set wins today. Bellis, the No. 3 seed, beat No. 16 seed Eva Guerrero Alvarez of Spain 5-7, 6-1, 6-2 and Gordon, the No. 6 seed, also lost her first set of the tournament, but she came though over No. 10 seed Ekaterina Antropova of Russis 6-4, 6-7(5), 6-4. Bellis and Jaeda Daniel and Gordon and Claire Liu also earned their way into the doubles semifinals with wins today. Gianni Ross, the No. 10 boys seed, is though to the quarterfinals with a 6-4, 6-4 win over No. 8 seed Philipp Klimov of Russia. Ross has yet to drop a set in the tournament. Both boys doubles teams from the US have been eliminated. See the Tennis Europe site for complete draws. Thursday's quarterfinal action at the Australian Open Junior Championships saw No. 1 seed Nikola Milojevic of Serbia defeated by Filippo Baldi of Italy, the No. 8 seed, 2-6, 6-3, 6-3. Baldi will play No. 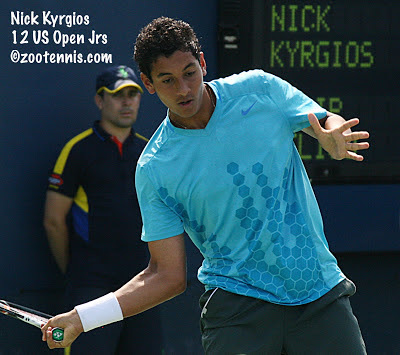 3 seed Nick Kyrgios of Australia in the semifinals. Thanasi Kokkinakis is hoping to make it an all-Australian boys final, when the wild card takes on No. 11 seed Borna Coric of Croatia in the other semifinal. The two most recent Orange Bowl champions are through to the girls semifinals, with 2011 winner Anett Kontaveit(10), who also reached the US Open girls final last year, playing No. 2 seed Katerina Siniakova of the Czech Republic, and 2012 Orange Bowl winner Ana Konjuh of Croatia, the No. 3 seed, playing unseeded Elizaveta Kulichkova of Russia. Konjuh has also reached the girls doubles final, with Canada's Carol Zhao. For more on the quarterfinals, see this article from the tournament website. Complete draws are here. The ITA Kick-off Weekend, which will decide the participants in the National Team Indoor Championships next month, is this weekend, and the ITA has put together two excellent previews of each region. The men's is here, and the women's is here. If I can, I hope to get over to the University of Miami, which is hosting Hawaii, Arizona State and Oklahoma to decide which women's team goes to Charlottesville, Virginia in two weeks. For the complete overview, see the Kick-off Weekend page at the ITA website. Sloane Stephens' stunning 3-6, 7-5, 6-4 win last night over Serena Williams has been the talk of the sports world today and for good reason. Williams was the prohibitive favorite before the tournament started based on her form in the past six months, and despite not being 100 percent physically, she hadn't had any difficulty reaching the Australian Open quarterfinals. Stephens was able to gather herself when she needed to, hit winners when they were demanded and yet was patient enough to wait for the Williams errors too. She closed the net and volleyed well, showing a dimension of her game that will prove valuable and can set her apart from the aggressive baseliners. She has no easy task in meeting defending champion and World No. 1 Vika Azarenka later tonight, giving her no time to savor the biggest win of her career, but she certainly rose to the occasion against Williams. Jon Wertheim of Sports Illustrated has more on Stephens' improbably victory here. Stephens wasn't the only teen to come up big Wednesday, with 16-year-old Ashleigh Barty reaching the women's doubles final with Casey Dellacqua. Barty and Dellacqua, who received a wild card into the draw, have yet to drop a set in the tournament. They will meet top seeds Sara Errani and Roberta Vinci of Italy in Friday's final. For more on their run, click here. In the junior championships in Melbourne, there hasn't been any result comparable to Stephens over Williams, with most of the top seeds remaining as the quarterfinals begin tonight (Thursday in Australia). No. 15 seed Allie Kiick, the last US player in singles or doubles, was blitzed by Orange Bowl champion and No. 3 seed Ana Konjuh of Croatia 6-0, 6-1 in less than an hour. There are two unseeded girls in the quarterfinals: Jelena Ostapenko of Latvia and Elizaveta Kulichkova of Russia. Ostapenko is young, just 15, and the 2011 Les Petits As champion had only one win in her three previous junior slam appearances, so this appears to be a breakthrough tournament for her. 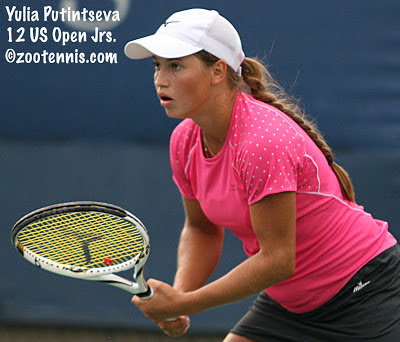 The 16-year-old Kulichkova, who was formerly No. 3 in the world, but didn't defend her Grade A title this year in Mexico, so her ranking fell. In the part of the bracket where Yulia Putintseva, a late withdrawal, was, Kulichkova has made the best of her good fortune, winning all three of her matches in straight sets. No. 4 seed Laslo Djere's first round loss provided an opportunity, and Matej Maruscak has made the most of it. The 18-year-old Slovakian outlasted Djere in the first round, beat a qualifier in the second round and came from behind Wednesday against Japan's Yoshihito Nishioka, a US Open boys semifinalist last year, to post a 4-6, 6-1, 9-7 win. Maruscak is playing in his first junior slam this week. The Australian Open website has this in-depth look at top seed Nikola Milojevic of Serbia, who is mentored by his country's top two players. Does anyone know if the coach mentioned in the story, Alex Slovic, is the former University of Washington All-American? Milojevic plays No. 8 seed Filippo Baldi of Italy in the quarters. No. 11 seed Borna Coric of Croatia, Maruscak's next opponent, is featured in this article from the ITF junior website, and he too has a famous mentor: former Wimbledon champion Goran Ivanisevic. In doubles, there were no seeded teams in the boys quarterfinals, meaning all eight seeds lost in the first or second round, an impressive coincidence, or evidence of the random method of ITF junior seeding, take your pick. Complete draws are available at australianopen.com. At Les Petits As, three US boys and two US girls are through to the round of 16. Teen Tennis champion CiCi Bellis, seeded third, has yet to be tested and No. 6 seed Michaela Gordon has also won both her matches in straight sets. No. 14 seed Sam Riffice, No. 10 seed Gianni Ross and unseeded Noah Makarome are the US boys in the final 16. Top seeds Andreea Rosca of Romania and Momir Kecmanovic of Serbia are through as well. The doubles teams Jaeda Daniel and Bellis, seeded No. 1, and Gordon and Liu, seeded No. 5, are through to the quarterfinals. Makarome and Patrick Kypson are also in the quarterfinals, although they were not seeded. For complete draws, see the TennisEurope site. If you are interested in Challengers, two items: There is a live stream at this week's Maui challenger, which can be found in the Pro Circuit section of usta.com. Secondly, the blog Foot Soldiers of Tennis explains why the LTA has discontinued its support of Challengers in Great Britain in favor of more Futures events, and has also gone to awarding money to its players based on specific results in tournaments. The Tennis Recruiting Network revealed its men's recruiting class rankings Monday, with the University of Virginia on top for the second year in a row, receiving 23 of 25 first place votes by the panel, which includes me. Because these rankings are subjective and don't take into account transfers, January admissions and many international players, they certainly don't directly correlate to a program's future success. But it is an interesting and handy way to survey what's happened on the recruiting front during the early signing period, always remembering there's another signing period coming up this spring for the class of 2013. The ITA released another set of team rankings today, but very little changed, with the dual season barely underway for some teams and not yet started for others. The Top 10s for both men and women are virtually the same as two weeks ago. The complete rankings are available at the ITA website. The NCAA announced over the weekend that the dramatic recruiting rule changes will be implemented beginning this August for the recruiting class of 2014. The restrictions on number and timing of phone calls, texts, messages, etc. are gone, and there are many, many other changes. The NCAA's announcement is here, the Associated Press story is here, and ESPN has an opinion piece here, which believes recruits will be inundated when all the rules are relaxed. The NCAA obviously believes the opportunity for a recruit and a coach to get to know each other better before a commitment outweighs this concern. One of the first important college tournaments of the year in California is the Sherwood Cup, which features most of the top Pac-12 players in an individual event prior to the start of the dual match season. 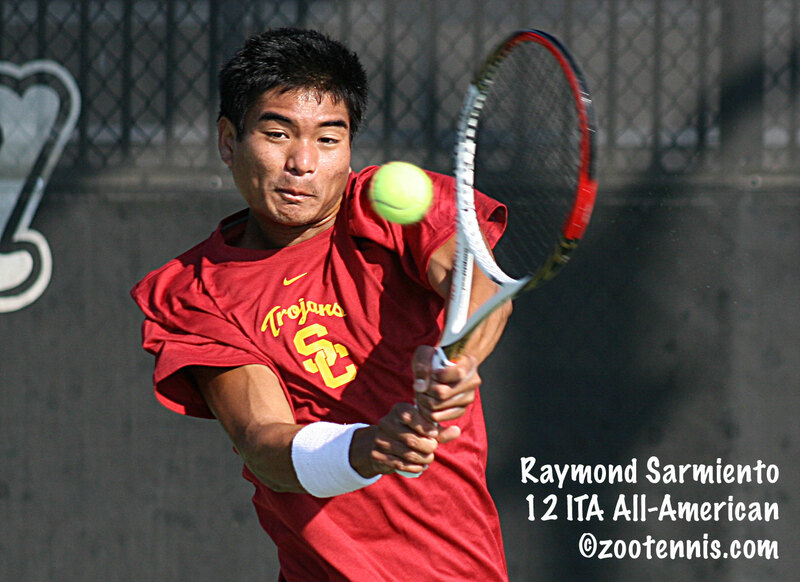 This year's winner was USC junior Raymond Sarmiento, the No. 1 seed, who defeated unseeded UCLA junior Adrien Puget 4-6, 6-3, 7-5 in yesterday's final. 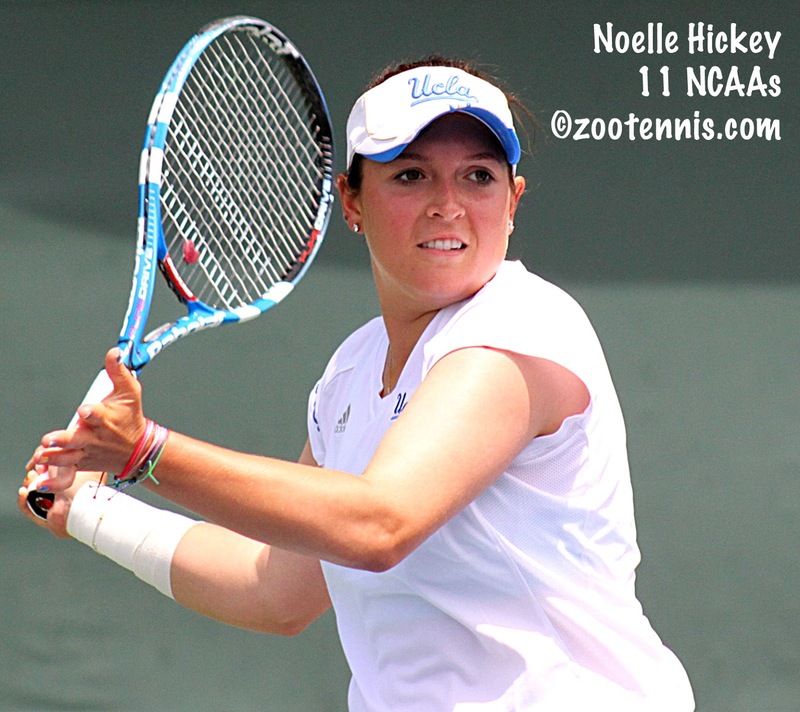 UCLA, who had three of the four semifinalists, won the doubles title over USC, with No. 3 seeds Marcos Giron and Dennis Novikov defeating unseeded Emilio Gomez and Eric Johnson 8-7(4). The complete draws, minus only those final two results, can be found here. Slide the bar at the bottom to the right for the doubles. 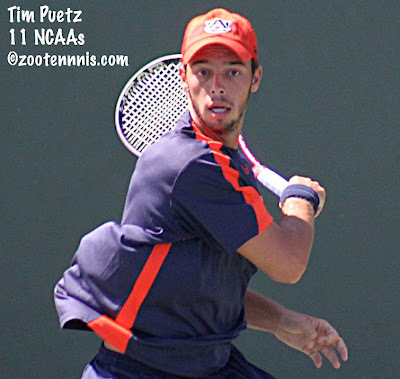 Former college stars Tim Puetz and Noelle Hickey won Futures events last week, while US veteran Robby Ginepri hopes to jump-start his stalled comeback with his victory at the $10,000 Futures in Sunrise, Fla. The 25-year-old Puetz, a former All-American at Auburn who reached the 2010 NCAA singles semifinals, won his third career Futures singles title at the $10,000 ITF Men's Circuit event in France. The unseeded German defeated three seeds along the way, including No. 1 seed Yannick Mertens of Belgium in the quarterfinals. In the final, Puetz downed 2010 Wimbledon boys champion Marton Fucsovics of Hungary 6-0, 4-1 retired. He also reached the finals in doubles, paired with former Wisconsin Badger Moritz Baumann, also of Germany. Hickey, who played at Georgia Tech, then transferred to UCLA, won her first ITF Women's title at the $10,000 event in Guadeloupe, defeating No. 4 seed Lea Tholey of France 7-5, 6-2 in the final. The 24-year-old from New Jersey, who like Puetz was unseeded, also picked up the doubles title with former Arizona State Sun Devil Kady Pooler. If you missed it, a few months ago I posted a link to this story about Hickey's return to the Pro Circuit after teaching at Court Sense, the club where the McHale sisters train. Formerly in the ATP Top 20, Ginepri, whose ATP ranking is now 286, was the sixth seed in Sunrise. He defeated unseeded Benjamin Balleret of Monaco 6-4, 6-2 in the final. Unseeded Daniel Dutra da Silva and Pedro Sakamoto of Brazil won the doubles title over the unseeded Italian team of Alberto Brizzi and Enrico Burzi 6-2, 6-7(8), 12-10. At the $25,000 women's tournament in Port St. Lucie, Fla., Canadian Sharon Fichman, who played the Australian Open qualifying, won her eighth career singles title on the ITF Women's Circuit, beating last week's Innisbrook champion Tadeja Majeric of Slovenia 6-3, 6-2 in the final. Fichman was the No. 2 seed, Majeric No. 4. Former Florida Gator Allie Will teamed with Angelina Gabueva of Russia to take the doubles title, beating last week's finalists Florencia Molinero of Argentina and Adriana Perez of Venezuela 4-6, 6-2, 10-7 in a battle of unseeded teams. This week there is no women's event in the United States, but there are two men's tournaments. Qualifying is complete for the $10,000 Futures event in Weston, Fla., where 14-year-old Stefan Kozlov, Mitchell Krueger and Jean-Yves Aubone received wild cards into the main draw. Qualifying for the $50,000 Challenger in Maui will be finished tonight, with the main draw full of former college players, including Tennys Sandgren, Dan Kosakowski, Steve Johnson, Bradley Klahn, Austin Krajicek, Rhyne Williams and wild cards Devin Britton and Dennis Lajola. There are also quite a few Americans in the $10,000 ITF Men's Circuit event in Ixtapa, Mexico, including California teens Deiton Baughman and Dante Saleh, both of whom qualified. With Allie Kiick the only American remaining in the singles draw at the Australian Open junior championships, there's not much news from Melbourne to discuss, but a couple of interesting stories emerged about two juniors who lost in the second round Monday: Duckhee Lee of Korea and Natalia Vajdova of Slovakia. Lee's hearing impairment is only now getting noticed by mainstream tennis writers, since this is the 14-year-old's first junior slam, and Simon Cambers writes about it for Reuters, obviously getting huge assistance from an interpreter. Vajdova is the daughter of Novak Djokovic's coach Marian Vajda, who obviously doesn't have the opportunity to travel with or even see her for long stretches due his responsibilities to the world's top player. But from this Straight Sets article by Ben Rothenberg, it's apparent that Vajda shares the same stress most parents feel when watching their child compete. The draws have been posted for Les Petits As, one of the most prestigious 14-and-under tournaments in the world. Qualifying is complete and first round action begins Monday in Tarbes, France. The top two seeds in the girls draw are Andreea Rosca of Romania and Sofya Zhuk of Russia, neither of whom played Teen Tennis or, for that matter, the Junior Orange Bowl. Rosca just won an ITF Grade 5 in Serbia. For the US, Teen Tennis champion CiCi Bellis of the US is the No. 3 seed, and Michaela Gordon is seeded sixth. Jaeda Daniel and Claire Liu are the other two US girls in the draw. All but Bellis are scheduled to play Monday. The top two seeds in the boys draw are Miomir Kecmanovic of Serbia and Samuele Ramazzotti of Italy. Kecmanovic was also the top seed at Teen Tennis, losing his first match in the second round, while Ramazzotti did not play in Bolton. Oddly, the boys Teen Tennis winner, qualifier Corentin Moutet of France, received a wild card into the main draw, but not a seed. Two of the four US boys are seeded: Gianni Ross is No. 10 and Sam Riffice is No. 14. Noah Makarome and Patrick Kypson are the other two US boys in the draw. All four will play on Monday. There is live scoring at the tournament website, as well as draws there, but I find the Tennis Europe draws easier to use. Monday in Australia, top seed Nikola Milojevic of Serbia barely escaped a major upset in his second round match with Australian wild card Oliver Anderson. Anderson, who finished fifth in the Junior Orange Bowl last month, served for the match at 6-5 in the third, but lost that service game and his next one to fall 6-2, 1-6, 8-6. Milojevic has lost his No. 1 ranking, according to this article on the Australian Open website, to Loy Yang Grade 1 champion Nick Kyrgios. Neither player has been beyond the quarterfinals in a junior slam in singles, so they won't stay in the top spot long if they don't improve on that record this week. American Jamie Loeb lost to No. 7 seed Anna Danilina of Kazakhstan 6-3, 5-7, 6-1 and No. 15 seed Mackenzie McDonald lost to Lucas Miedler of Austria 6-4, 6-2, leaving Allie Kiick the sole American junior still in singles. Kiick, the No. 15 seed, plays later Monday. There were two other ITF Grade 1 tournaments this week: the Copa Barranquilla in Colombia and the Czech International Indoor. Roman Safiullin at the International Spring Championships in Carson, Calif.
Roman Safiullin of Russia, who won the 16s International Spring Championships title in Carson last year, claimed his first Grade 1 title in the Czech Republic. The No. 4 seed defeated No. 3 seed Pavel Staubert of the Czech Republic 7-6(3), 6-1. No. 6 seed Alina Silich of Russia won the girls title, downing Anhelina Kalinina of Ukraine 6-1, 2-6, 4-0 ret. At the Copa Barranquilla, Colombian Diego Pedraza, who trains at the IMG Bollettieri Academy, picked up his first ITF Grade 1 title, defeating unseeded Marcelo Zormann da Silva of Brazil 2-6, 6-4, 6-3. Pedraza, the No. 14 seed, was a semifinalist in singles and finalist in doubles last week at the Copa Gatorade, so his ranking is rising quickly now. Varvara Flink of Russia, who won the Grade 1 Coffee Bowl earlier this month, must have been a late entry in Colombia, because she was forced to qualify. Once she did (only one win was required), Flink was the No. 3 seed in the draw, and she dropped only one set en route to the final, where she beat No. 2 seed Laura Ucros of Colombia 6-1, 6-3. After five Grade 1s this month, there are no more on the ITF junior schedule until March. Four of the six US players in the Australian Open Junior Championships draw played their opening matches Saturday, with three of them advancing to the second round. Unseeded Jamie Loeb, making her debut in Australia, needed only 55 minutes to get past Italy's Camilla Rosatello 6-1, 6-2 and will next play No. 7 seed Anna Danilina of Kazakhstan, who won the Grade 1 warmup in Traragon a few days ago. Kiick, the No. 15 seed, had a bit more difficulty getting past another Italian, Deborah Chiesa, failing to serving out the second set at 5-3, but she broke to earn a 6-3, 6-4 victory. Her opponent in the second round is Shilin Xu of China, a 15-year-old who competed in junior events in Florida as recently as last year. Mackenzie McDonald, the No. 13 seed and a semifinalist in 2012, overcame a rough start against Dukyoung Kim of Korea to post a 3-6, 6-0, 6-1 win. He faces Lucas Miedler of Austria in the second round. Martin Redlicki was the sole American to fall on Saturday, losing to No. 11 seed Borna Coric of Croatia 6-2, 6-4. Christina Makarova(9) and Thai Kwiatkowski(12) play their first round matches Sunday (this evening in US). 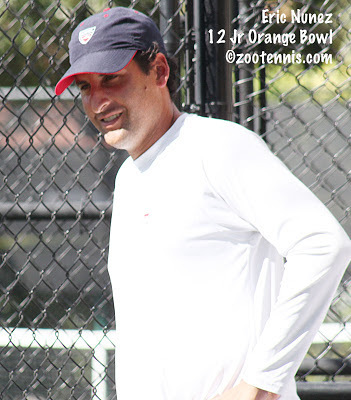 There were few surprises on the first day of play, but one rather large one in the boys draw, with Eddie Herr finalist and Orange Bowl champion Laslo Djere of Serbia, the No. 4 seed, losing to Matej Maruscak of Slovakia 6-4, 6-7(7), 6-2. Djere also lost in the first round of the Grade 1 warmup, so it's fair to suggest that the Har-Tru surface in the Florida events suits his game better than the hard courts in Australia. The top seed, Nikola Milojevic of Serbia, cruised to a 6-3, 6-1 win over Jurence Mendoza of the Philippines. Qualifier Duckhee Lee, the 14-year-old Korean who is hearing-impaired, won his first junior slam match, defeating wild card Jacob Grills of Australia 6-4, 7-6(4). To follow up on the Nicolas Jarry question, Tennis Australia did correct their draws, which initially had shown Jarry as playing for USA, to Chile, which the ITF had shown since the beginning of the year. Jarry lost his first round match Saturday. The doubles draws have been released, and all six Americans are paired with players from other countries: Loeb with Rebecca Peterson of Sweden, Kiick with Elise Mertens of Belgium (seeded third), Makarova with Katy Dunne of Great Britain, McDonald with Mazen Osama of Egypt(seeded seventh), Redlicki with Wayne Montgomery of South Africa (seeded sixth) and Kwiatkowski with Elias Ymer of Sweden (seeded second). Jarry and Christian Garin, also of Chile, who won the Yucatan Cup, Eddie Herr and Orange Bowl, are not seeded, and will be a tough second round test for top seeds Coric and Djere, if both teams win their openers. I'm delighted to see the Australian Open website covering juniors from the first day, as in the past, they've rarely bothered with the juniors at all until the finals. There is a daily recap here, and a full feature on Sara Tomic, Bernard Tomic's 14-year-old sister, who won her first round match as a wild card over the same player--Gabriela Pantuckova of the Czech Republic--she defeated in the opening round in Traralgon. I've never seen Tomic play, but it sounds as if her game differs substantially from that of her older brother, who lost an entertaining third round match to Roger Federer on Saturday night 6-4, 7-6(5), 6-1. Sloane Stephens of the US once again won the highly anticipated battle of teenagers, beating Laura Robson of Great Britain 7-5, 6-3. I was impressed by Stephens' composure throughout the match, especially in the first set when she let a 4-0 lead get away and was still undoubtedly getting used to the overwhelming crowd support her opponent was receiving because Robson was born in Melbourne. It wasn't the best tennis I've seen this week, but Stephens found her way through it and will face Bojana Jovanovski of Serbia in the fourth round. This BBC article focuses on Robson's shoulder problem as one of the reasons she made so many errors in the match. 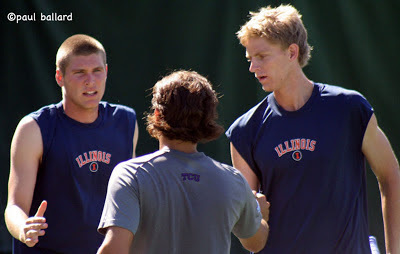 Kevin Anderson, the former All-American at Illinois, reached the fourth round of a grand slam for the first time after beating No. 22 seed Fernando Verdasco of Spain on Friday, and will meet Tomas Berdych of the Czech Republic Sunday. Anderson, the 2006 NCAA doubles champion (with Ryan Rowe) is also still alive in doubles, reaching the third round with Israel's Jonathan Erlich. And speaking of Illinois tennis, the men's and women's teams are experimenting with alternate formats this week in non-conference play. In one match, the women are playing one doubles match (worth two points) and four singles matches simultaneously with all matches no-ad and in another, they are playing traditional format but with no-ad. I don't like no-ad, and I never have, so I hope this format doesn't catch on, but maybe I'll prove to be in the minority. The men are trying an even more radical change, counting every game with the highest cumulative score winning, as well as allowing substitutes. I don't think tennis is basketball, and I don't think it should aspire to be, but an interesting idea nonetheless. In the final day of the Tennis Europe Level 1 14-and-under Aegon Teen Tennis Tournament in Bolton, CiCi Bellis added the singles title the doubles championship she won with Jaeda Daniel on Thursday. The fifth-seeded Bellis, a 13-year-old from Atherton, Calif., defeated unseeded Lucie Wargnier of France 6-2, 6-4 to claim the title. Qualifier Corentin Moutet of France took the boys title with a 6-2, 6-3 victory over No. 3 seed Ergi Kirkin of Turkey. For complete draws, see the Tennis Europe website. Les Petits As qualifying begins Saturday, and the draws are now posted at the tournament website. All eight US players are in the main draw. We're just a few hours away from the start of the Australian Open Junior Championships, with six Americans--three boys and three girls--in the draw. Nicolas Jarry is listed as representing USA on the Australian Open website, but as Chile on the ITF junior website's draws, so I'm assuming that's just an error based on his recent change. I've requested clarification from Tennis Australia on this. The big news with this morning's release of the draws was the late withdrawal of Yulia Putintseva of Kazakhstan, who was slated to be the number one seed. Since her withdrawal came after the draw was made, the next player that would have been seeded, Romania's Ilka Csoregi, moved into her spot at the top of the draw. The main beneficiaries of Putintseva's dropping out are Csoregi, lucky loser Bridget Liddell of New Zealand, and Croatia's Ana Konjuh, the No. 3 seed, who now is the only Top 4 seed in the top half. If Konjuh was lucky, Thai Kwiatkowski of the US was not. The No. 12 seed and Orange Bowl semifinalist unluckily drew Thanasi Kokkinakis the 16-year-old Australian who played so well against Steve Johnson in the opening round of men's qualifying. Every junior slam needs a blockbuster first rounder, and I certainly would be courtside for that one if I were in Melbourne. The Kokkinakis - Kwiatkowski match in not on Saturday's schedule, but four other Americans are. Allie Kiick, the No. 15 seed, faces Italian Deborah Chiesa and Jamie Loeb plays unseeded Camilla Rosatello, also of Italy. Boys No. 13 seed Mackenzie McDonald, a semifinalist in Melbourne last year, plays Dukyoung Kim of Korea and unseeded Martin Redlicki faces No. 11 seed Borna Coric of Croatia for the second time in two months. Coric defeated Redlicki 1-6, 6-2, 6-1 in the first round of the Orange Bowl last month. Christina Makarova, the No. 9 seed, is not on today's (Saturday in Australia) schedule. She will play Jelena Ostapenko of Latvia in her first round match. The ITF preview, which doesn't mention the Putintseva withdrawal, is here. Tom Walker, a respected junior development coach in Michigan, has been vocal regarding his objections to the USTA junior competition changes since they were first announced last year. This is the article he wrote for zootennis back in March, when the changes had yet to be voted on by the USTA's sections. I spoke with Tom this morning, and he believes there is no advantage to adjustments and tweaks, and that the USTA must start again, from the beginning, with an open mind. He has created a Facebook page devoted to his opposition to the changes, which can be found here. His complete assessment of the best way to move forward is below. This is page is dedicated to spotlighting the insane 2014 changes to the USTA National Junior Tournament Calendar and hopefully to motivate Dave Haggerty, Kurt Kamperman, the new Junior Tournament Competition Committee, the 17 Sections and the new USTA Board of Directors to permanently pause these changes and devise a new plan that is thoroughly vetted, transparent and agreed upon by the tennis industry at large. Last year the USTA sections passed a sweeping new National Junior Tournament Plan that was to take effect in 2013 and 2014. This plan involved shrinking the opportunities to play National tournaments for US juniors by a significant margin. • The creation of a logical progression of earned advancement from local play to sectionals to nationals to ensure that the best players move on to nationals (the best have earned the right to play) – not the players from families with more economic flexibility. While those stated goals are noble on the surface, many in the industry question if those were the actual goals and anyone with the slightest knowledge of junior tournament tennis quickly realized that the 2014 plan did exactly opposite of these stated goals for the overwhelming majority of players. Cost – under the 2014 plan, players will have 9 chances to play National tournaments during the course of the year. If a player was going to play 9 national events in the year, they would now be completely wed to this schedule. You could likely poll first graders and realize that if a player had 9 chances to 9 events, it is going to cost more than if they had 30 or 40 chances to play 9 events. School – school breaks and testing schedules have never been more fragmented. Again when choice is taken away, the homeschooled kids with flexible schedules or the lucky kids whose breaks and test schedules match up with the USTA schedule will be fine while the rest of the kids will be left missing more school and will have more balancing of tests and tournaments. Earned Advancement – this is nothing more than propaganda to pretend like there are a bunch of rich kids flying around in private jets chasing points and unfairly advantaging themselves against the kids of lesser financial means. There has always been earned advancement. The 2014 plan doesn’t change any of the earned advancement for the rank and file junior tennis player, but it does give the USTA more wild cards so that their own players are not subject to have to play in their sections. So this plan of earned advancement not only doesn’t fix a problem that doesn’t exist, it creates a pathway for a few of the chosen ones to completely avoid earning their advancement. So on all three stated goals, these changes completely fail any reasonable smell test. The 2014 plan has been universally panned by an overwhelming majority of parents, coaches, junior players, college players, professional players, famous ex-pro players and virtually every person of significance in the tennis industry. To the credit of some of the USTA brass in October of 2012, a group: Jon Vegosen (past USTA President,) Kurt Kamperman (USTA CEO of Community Tennis,) Dave Haggerty (USTA President,) Gordon Smith (USTA GM) and Bill Mountford (USTA rep) met with a resistance group of tennis parents and industry figures including: Antonio Mora (father of a junior,) Robert Sasseville (tournament director,) Steve Bellamy (father of 4 juniors and founder of Tennis Channel,) Sean Hannity (father of 2 juniors) and Kevin Kempin (father of 2 juniors and the CEO of Head.) From that meeting, the USTA agreed to “pause” the 2013 changes and have a “listening tour” in various parts of the country. The history of the changes are that Jon Vegosen (former President) enlisted Tim Russell (music professor no longer involved with the junior comp committee) and his committee of 20 (with whom virtually none were parents or coaches of junior players and 1/2 of whom are no longer on the committee) to come up with a new plan. That plan was then given to player development (who are no longer involved in the process) who supposedly were the ones who cut all the opportunity and gave themselves more wildcards. This plan was then pushed around the USTA sections under the guise of cutting costs, upping school attendance, criminalizing the supposed points chasers and giving the sections back all their talent who were now playing Nationally. Although the plan was passed by a margin of 16 to 1, rampant were reports of anyone speaking out against the changes being ostracized, bullied to get on board and even fired. Many section leaders who voted for the changes now say that they would not have voted the way they did had they understood what they were voting for. Others have said they received substantial political pressure to vote for the changes. Basically an election in a country with a dictator took place to slam the changes through while Vegosen’s administration was in place. Virtually no parent, coach, college coach or person in tennis was abridged of these changes prior to them being passed and there were specific directives from USTA managers not to let the tennis industry know about the changes until after they had passed. Additionally, little foresight was given to the impact of the changes to college coaches. The changes will directly push a large portion of college coaches out of using their recruiting travel budgets for USTA events and move them to ITF events, therefore creating even less US players getting seen by college coaches which is the driving reason that many US kids play junior tennis. There are many other negatives as well. The goal of this page is to mobilize the tennis industry to push the USTA to get this process permanently paused and a new plan put in place that is transparent, smart and vetted by all the parties impacted in junior tennis. In lay terms, WE DON’T WANT A COMPROMISE BY ADDING BACK OPPORTUNITY TO AN UNVETTED, BROKEN PLAN. WE WANT A NEW PLAN AND THE ABILITY TO WORK WITH THE USTA TO GET THE PLAN THAT IS BEST FOR US JUNIOR TENNIS. California's CiCi Bellis has reached the final of the Aegon Teen Tennis tournament in Bolton, England, where she will meet fellow 13-year-old Lucie Wargnier of France in Friday's final. Bellis, the No. 5 seed, reached the quarterfinals of the Junior Orange Bowl 14s last month, so her performance is not unexpected, but Wargnier is something of a surprise finalist, as she lost in the first round of the Junior Orange Bowl to Alexis Nelson of the US. Wargneir prevented an all-American (and all-Northern California) final today when she defeated No. 8 seed Michaela Gordon 6-4, 6-2, and also defeated No. 16 Claire Liu of the US earlier. Bellis, who has yet to drop a set, downed No. 2 seed Eva Guerrero Alvarez of Spain 6-2, 6-2 in the semifinals. 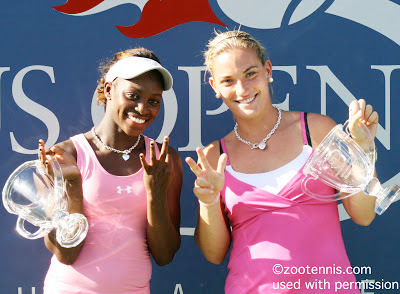 Bellis teamed with Jaeda Daniel to claim the doubles title in what was an all-American final, with Bellis and Daniel, the No. 4 seeds, beating No. 8 seeds Gordon and Liu 7-5, 6-3. The US boys did not reach the later stages of the tournament in singles or doubles. The boys final will be between qualifier Corentin Moutet of France and Ergi Kirkin of Turkey. Moutet defeated No. 2 seed Kacper Zuk of Poland 6-3, 6-2 in the semifinals, while No. 3 seed Kirkin downed Matteo Martineau, another French qualifier, 3-6, 6-3, 6-2. Like Bellis, Kirkin has already claimed one title; winning the doubles with Alexei Popyrin of Australia. The No. 2 seeds defeated No. 7 seeds Jonas Eriksson Ziverts and Karl Friberg of Sweden 6-4, 6-0 in today's final. Complete draws can be found on the Tennis Europe website. Obviously Kokkinankis, the 16-year-old who went 17-15 in the third with Steve Johnson in the opening round of men's qualifying, immediately becomes one of the favorites for the boys title. Tomic, the 14-year-old sister of Bernard, the last Australian standing in the pro singles, reached the quarterfinals of the Grade 1 Loy Yang in Traralgon as a wild card, losing to eventual champion Anna Danilina of Kazakhstan. Danilina, seeded No. 5, defeated No. 2 seed Antonia Lottner 6-4, 6-2, and in the boys final, Nick Kyrgios of Australia, the No. 2 seed, beat No. 6 seed Wayne Montgomery of South Africa 6-1, 6-2. The list of entrants I received does not contain Sachia Vickery of the US, and there is already a lucky loser in the draw, Australia's Brooke Rischbieth, who I am assuming took Vickery's place. That leaves six American juniors total in the main draw: Christina Makarova, Allie Kiick, Jamie Loeb, Thai Kwiatkowski, Mackenzie McDonald and Martin Redlicki. Eighteen-year-old Yulia Putintseva of Kazakhstan, who lost in the second round of the women's draw Thursday, is still scheduled to compete, and she will be seeking that elusive junior slam title as the top seed due to her WTA ranking inside the top 150. The ITF junior No. 1 is automatically the top seed regardless of the WTA ranking of any entered girl, but because Taylor Townsend, the current No. 1 (and defending champion, who beat Putintseva in last year's final) isn't playing, Putintseva will be No. 1. My weekly article for the Tennis Recruiting Network continues a tradition I established many years ago--looking ahead to the new year in college and junior tennis with eight questions I'm eager to have answered. This year I discuss formats and schedules, big shoes to fill in college and the new young women poised for breakthroughs. The final round qualifying for the Australian Open junior championships is Thursday, with the main draw beginning on Saturday at Melbourne Park. As I've mentioned before, US players are few in Australia this year. Luke Gamble made the trip Down Under, but he was the only US junior in the qualifying, and he lost to Alexander Zverev of Germany in the second round. Unlike the other junior slams, the Australian is a 48-player draw, which I don't really understand, because they rarely fill it. There are some excellent players in qualifying however. I was impressed by 14-year-old Olga Fridman of Ukraine this year at the Eddie Herr and Orange Bowl on the girls side, and in the No. 2 seed in the boys qualifying, 14-year-old Duck Hee Lee, is the youngest player in the ITF Top 100. 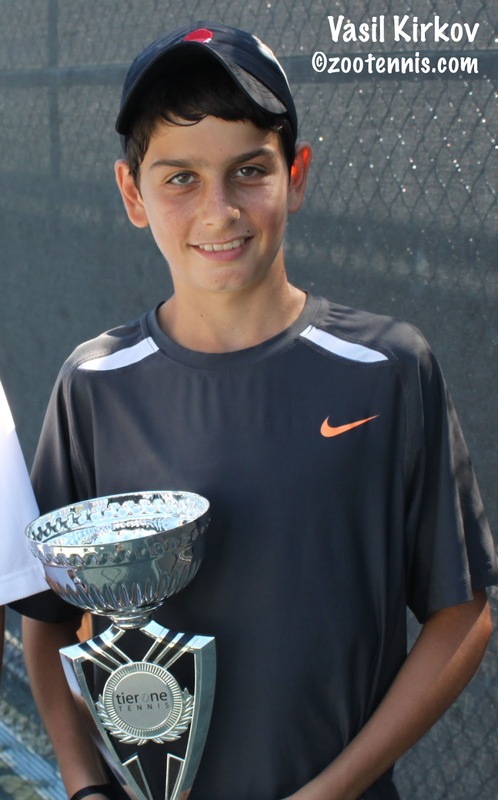 Lee, the 2012 Eddie Herr 12s champion, has continued his rise in the ITF junior rankings despite being deaf, and last week he won a Grade 3 in India. The qualifying draws are available at the ITF junior website. And for a story on one of the US players in the main draw, see this article on Jamie Loeb, who did not play in Traralgon. At the Grade 1 Loy Yang in Traralgon, No. 2 seed Antonia Lottner of Germany will meet No. 5 seed Anna Danilina of Kazakhstan for the girls title, while No. 6 seed Wayne Montgomery of South Africa will face No. 2 seed Nick Kyrgios of Australia for the boys title. Thursday's action at the Australian Open was both riveting and sad. The Jerzy Janowicz - Somdev Devvarman match was full of drama and at times, outstanding tennis, with the 22-year-old from Poland pulling out a 6-7(10), 3-6, 6-1, 6-0, 7-5 victory over the two-time NCAA champion from Viriginia, who is just returning to competition after a long layoff due to shoulder surgery. The sad news was Brian Baker's injury during his match with Sam Querrey. After winning the first set in a tiebreaker, Baker hurt his knee, which gave way during a routine point. Baker has been diagnosed with a torn lateral meniscus and will need surgery, but could return in three or four months. For more, see this article at ESPN. 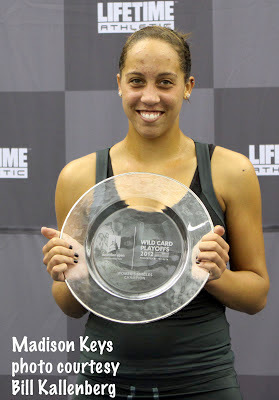 Most of the superlatives of the day came after Madison Keys rolled past No. 30 seed Tamira Paszek of Austria 6-2, 6-1 in less than hour, continuing her outstanding play this month. The ESPN and Tennis Channel commentators were effusive in their praise of her serve in particular, and projections that she would be Top 10 and a grand slam champion surfaced on the air and on twitter. A few people I follow are disturbed by this hype, and it's not difficult to understand why. Recent history has given us Donald Young and Melanie Oudin, and eager Americans can be prone to see the next Sampras or Serena in every player who posts a few impressive results. Courtney Nguyen at Sports Illustrated provides five reasons to believe the Keys hype, while her colleague Jon Wertheim reminds us just how much a country's tennis fortunes rely on luck. Christopher Clarey of the International Herald Tribune and the New York Times acknowledges the dilemma, and Keys' agent, Max Eisenbud of IMG, believes Sloane Stephens, who is nearly two years older, can help Keys simply by absorbing some of the attention that is always focused on an American star. Clarey doesn't confine his article to Keys, but also looks at 16-year-old Donna Vekic, and talks to Chris Evert, who is convinced the days of a teenager dominating grand slams is over. My two cents: Keys is not hype. She has the game to win on the WTA tour, and she has proven that this month. The WTA age restrictions have undoubtedly helped her stay out of the spotlight the past few years while she's worked on her game, both physically and mentally, and given her the opportunity to suffer losses on the Pro Circuit level that didn't destroy her confidence. She has also had her share of ill health and injuries, which doesn't mean that she's free of those setbacks, anymore than it meant Brian Baker was due a healthy end to his career. In short, there's no predicting the future--for her, or for anyone. But, staying in the moment, as players are always told to do, isn't a bad place for fans of Madison Keys right now.